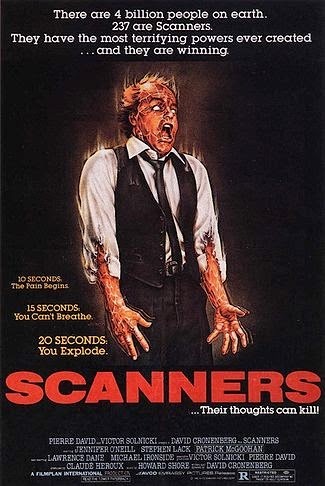 Scanners is a 1981 Canadian science-fiction action horror film written and directed by David Cronenberg and starring Jennifer O'Neill, Stephen Lack, and Patrick McGoohan. In the film, "scanners" are people with unusual telepathic and telekinetic powers. ConSec, a purveyor of weaponry and security systems searches out scanners to use them for its own purposes. The film's plot concerns the attempt by Darryl Revok, a renegade scanner, to wage a war against ConSec. Another scanner, Cameron Vale, is dispatched by ConSec to stop Revok. This is a poster for Scanners. The poster art copyright is believed to belong to the distributor of the item promoted, Avco-Embassy Pictures, the publisher of the item promoted or the graphic artist. Further details: Box art for the 1981 David Cronenberg film, Scanners. The poster art can or could be obtained from Avco-Embassy Pictures. Main infobox. The image is used for identification in the context of critical commentary of the work, product or service for which it serves as poster art. It makes a significant contribution to the user's understanding of the article, which could not practically be conveyed by words alone.The image is placed in the infobox at the top of the article discussing the work, to show the primary visual image associated with the work, and to help the user quickly identify the work product or service and know they have found what they are looking for.Use for this purpose does not compete with the purposes of the original artwork, namely the creator providing graphic design services, and in turn the marketing of the promoted item. As poster art, the image is not replaceable by free content; any other image that shows the same artwork or poster would also be copyrighted, and any version that is not true to the original would be inadequate for identification or commentary.